An Israeli flag picturing abducted Israeli soldier Gilad Shalit and the word "help," seen during a march in Jerusalem on July 8. (CNN) -- Britain on Saturday demanded the release of Gilad Shalit as the Israeli soldier marked his 24th birthday in Hamas' captivity. 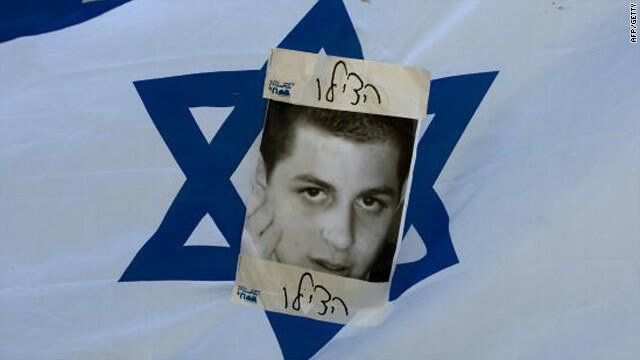 "The thoughts of many in Britain are with Gilad Shalit and his family," the Foreign Office said. "His detention is unjustifiable and unacceptable. The British Government demands his immediate and unconditional release." Shalit has been held captive since June 25, 2006, when Palestinian militants from Gaza captured him. The militants had tunneled into Israel and attacked an Israeli army outpost near the Gaza-Israel-Egypt border, killing two soldiers in the assault. Israel immediately launched a military incursion into Gaza to rescue Shalit, then 19, but failed to free him. In October 2009, Hamas released a tape of Shalit as a proof of life, in which he urged the Israeli government to do more for his safe release. Shalit's family has been working to free the soldier and ramped up their efforts during the current holy month of Ramadan. Noam Shalit, the soldier's father, recently appealed directly to Palestinians in Gaza to put pressure on their Hamas leadership for a prisoner swap during the Muslim holy month of Ramadan, which ends September 9. The father has repeated his stance that the Israeli government should release 1,000 prisoners, including 450 whose release Hamas has demanded in exchange for his son. He has been holding a vigil outside the home of Israeli Prime Minister Benjamin Netanyahu since early July, when he led a march to his doorstep to support a prisoner exchange as a way to release his son. This Ramadan is different than the previous four, Shalit said, because there is now a deal that was put on the table at the beginning of the year by a German mediator. "If the two sides of the conflict show some flexibility, it will be possible to make an agreement," Shalit said. Such an agreement, Shalit said, would benefit thousands of Palestinian families who would have their fathers and sons back to celebrate the festival of Ramadan. "I would welcome any release of Palestinian prisoners, but I would welcome the release of one Israeli prisoner," said the emotional Shalit, raising a solitary finger. The issue of Shalit came up after British Prime Minister David Cameron issued tough talk about the Palestinian territory of Gaza during a visit to Turkey, comments seen as criticism of Israel. "Let me also be clear that the situation in Gaza has to change. Humanitarian goods and people must flow in both directions. Gaza cannot and must not be allowed to remain a prison camp," Cameron said. He also referred to the territory as a "prison camp." Residents of Gaza say they have suffered greatly under an Israeli goods blockade implemented since Hamas took control of the territory after elections in 2006. But Israel says its tough measures are necessary to stop weapons from reaching Hamas militants intent on destroying Israel. Ron Prosor, Israel's ambassador to Britain, reacted quickly to the prime minister's remark, saying that Hamas is responsible for the misery in Gaza and raised the issue of Shalit's captivity. "We know that the prime minister would also share our grave concerns about our own prisoner in the Gaza Strip, Gilad Shalit, who has been held hostage there for over four years, without receiving a single Red Cross visit," Prosor said.